Jaguar unveiled an all-new 2006 car, called simply the XK, at the Frankfurt Motor Show in September 2005. Designed by Ian Callum, who also worked on the gorgeous Aston Martin DB9 and Vanquish, the new XK bares a striking resemblance to its Aston cousins. Offered as both coupe or convertible it was a direct replacement for the previous XK8 model. The new XKs body is an all-aluminium construction, giving the coupe a kerb weight of just 1595kg (1635kg for the convertible) whilst still maintaining best-in-class torsional rigidity. It is powered by a 300 hp version of the 4.2 L AJ-V8 mated to a new Jaguar Sequential Shift 6-speed automatic transmission giving a 0-60 time of 5.9 seconds and completes the quarter mile sprint in 14.4 seconds (only half a second off the previous supercharged model). 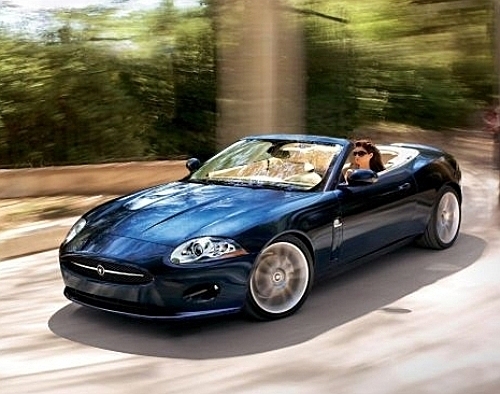 In November 2006 Jaguar launched the much anticipated 2007 XKR supercharged version of the XK. The heart of the new XKR is a supercharged version of the 4.2 litre AJ-V8 engine, producing 420 bhp at 6,250 rpm and an impressive 413 lb-ft of torque, accelerating the XKR from zero to 60 mph in just 4.9 seconds (5.0 for the convertible) and on to an electronically limited top speed of 155 mph. In January 2009 Jaguar launched the 2010MY facelift versions of the second generation XK and XKR. The cars feature a new 5.0-litre V8 engine, the AJ-V8 Gen III, available in both normally aspirated and supercharged versions, as well as revised exteriors and improved technology such as Adaptive Dynamics replacing the previous CATS system. Transferred from the XF, the Jaguar Drive Control is also now available on the XK range. For the first time in some 14 years, Jaguar enthusiasts will now be able to cheer on an officially-backed Jaguar sports car in European racing. The last Jaguar sports car team to enjoy factory backing was Rocketsports in the North American Trans-Am series, running the old shape XKR, and prior to that was the TWR XJ220C back in the early 1990s. Now its the turn of Apex Motorsport with the new XKR GT3.